During one of my recent classes dedicated to beginners, one of them after listening very carefully came to me and asked me why sanshin = 3 spirits/hearts when we have the gogyô = 5 elements? Or to make it simple why does 3 = 5? What I like with beginners is that they are so eager to understand that they come and ask things that a higher rank or older student would not dare to ask. And what I like is that it is often much deeper as a question than what it appears at first glance. So why does 3 = 5? The forms of the five elements was originally called shoshin gôkei gogyô no kata and was later called by sensei the sanshin no kata. 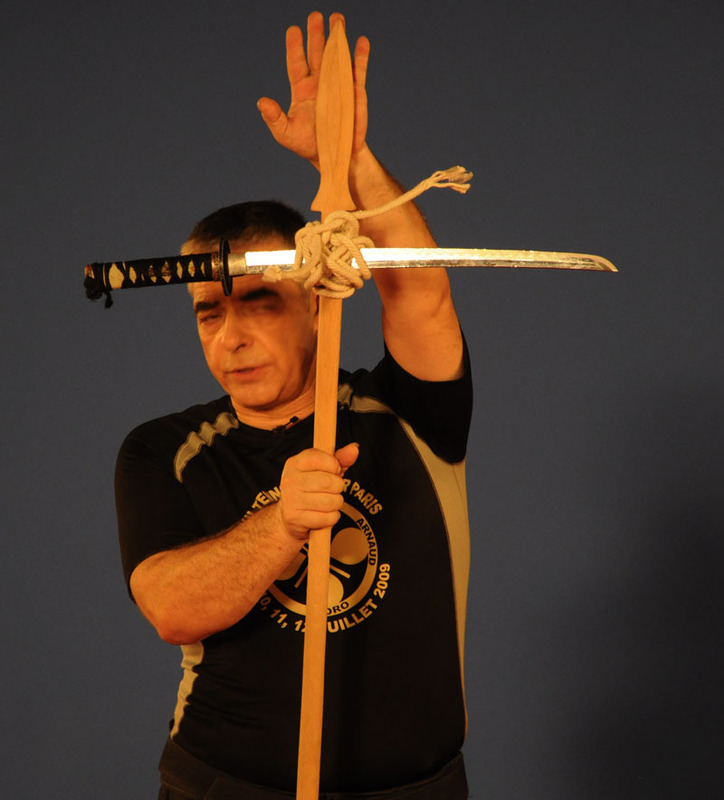 Today in the bujinkan we call them either “sanshin no kata” or “gogyô no kata”. Sanshin written 三身 are the three jewels of Buddhism but in the bujinkan it is written 三心 it means the 3 spirits/hearts. We will see later what it covers. Gogyô are the five (japanese) elements 五行. Here gyô 行 has the meaning of practice, training, or exercise (as in shugyô 執行, ascetic practice). The gogyô are also often called “godai” 五大 or gotai 五体to show the importance of the five elements chi 地, sui 水, ka 火, fû 風, kû 空 they are the basic bricks constituting the fabric of time and space leading to the 6th element shiki 識, consciousness, wisdom (sanskrit “vijJaana”, विज्ञान). Now if we look at the name gôkei the only thing I found is 合計 and means “total sum”. Knowing that shoshin here 初審, means “initial, original”; the name can be understood as the “five training forms to develop the initial unity (body and mind)”. To put it simply these five exercises are the root to understand the whole, the multiplicity of possibilities leading to unicity; or how to move naturally. Then, why 3 = 5? Because both terminologies define different aspects of the same things. Sanshin refers to past, present and future. You learn through the five forms to move before the attack, during the attack, after the attack. With this you develop your understanding of timing and rhythm. Sanshin refers to the three levels of ten chi and jin. You apply the 5 forms and focus either on the arms (ten level), on the legs (chi level) or on the whole body (jin level). Sanshin also refers to the 3 moments in each one of theses forms: kamae, ukemi, kaeshi. Attitude, reception, counter. Sanshin refers also to beginners, intermediate, and advanced as anyone can find something new depending on his or her level of proficiency. This last explanation also tells you why there can be different “truths” in how to do these movements. Sanshin is behaving with the mind of a three year old kid. If you can keep this at any time you will find the natural movement. Gogyô refers to the five elements that we perceive. Please note that we refer here to the Japanese (or Tibetan) elements and not to the Chinese. The godai or gogyô are always centered on chi, earth. Sensei explained once that unlike the Chinese, the Japanese understanding of the elements always went through chi. We have chi, chisui, chika, chifû, chikû. When you make it in a drawing it draws some kind of cross with chi in the center. Gogyô refers to the five senses leading to the 6th sense. We saw that shiki, consciousness is achieved through the mastership of the five elements. Gogyô also refers to the five directions (forward, backward, left, right, middle). The naname 斜め (diagonal, obliqueness) are variations of the previous ones. Those five exercises are excuses to master the five manifestations through footwork and movements in order to find the natural flow to achieve consciousness with the help of these three hearts. So 3 = 5 and this also why in certain schools like gyokushin ryû, sensei calls the sanshin no kata, the kihon happô! “In the Bujinkan dôjô the rank of 15th dan, (…) expresses the idea of 3 hearts x 5 elements = 15 austerities” (“unarmed fighting techniques of the samurai” Hatsumi sensei, p. 34). The sanshin no kata or gogyô no kata is the essence of the bujinkan arts and this is why we have to train these series at each class. As sensei wrote in the TRNT (page 69): “I look for a warrior who has, shall we say, the cardinal point of consistently embodying the warrior way with the spirit of a three year old even as he reaches one hundred, the soul of sanshin, a talent of imperfection”. nb1: did you notice that there are 5 explanations for sanshin and 3 for gogyô? nb2: did you notice that the explanation for sanshin in the TRNT book is given p. 69? nb3: do not trust your senses, develop the 6th one! Previous Post Ki is Natural not Magic! Just a loose random friday evening thought….